When I first delved into wet shaving Wickham’s Super Smooth lavender was one of my first shaving soaps. Its scent would fill the den and I always looked forward to using it. Then something unexpected happened in social media the word was out that Wickham’s was going out of business. I rushed to the forum’s and it was everywhere. Wickham was closing its doors after inventory was gone. Each week as I saw inventory on the website shrink I thought the rumors must to be true. It was only a matter of time before they closed the doors for good and the website taken down. Then a metamorphosis the Wickham Soap Company has risen with the power and enthusiasm like never before. Gone is the old shaving soap line called Super Smooth. 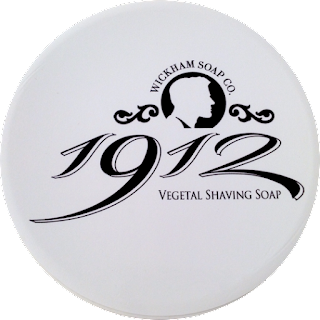 Taking its place is the completely reformulated shaving soap called 1912. This rebirth all started in 2014, Darron stumbled upon an old shaving soap formula manufactured commercially in England in and around 1912. A naturally inquisitive chap, and excited to try something new, Darron thought it would be fun to recreate. He enlisted product testers, all of whom strongly approved the formula as essential for the wet shaving community. Darron was onto a winner. Unfortunately, there were a handful of complications yet to tackle. As a one-man show, Darron was limited by his ability to produce small batches and encountered a few unwanted characteristics, but he continued, undeterred, to overcome this challenge. Two years on, and Darron has reformulated what was once a mass-produced soap to become a true Artisan shaving soap for the modern man. This is 1912. Let’s start with the packaging. Gone are the old tubs with yellow pop on lids, we now have a modern looking white plastic tub with screw on lids. A redesigned black & white label with the company logo on top with side labels denoting the scent. On the bottom we have the ingredients, website, batch number and a scan code which points to some additional background information about the company. Also included with the tub a new wider opening for better brush loading. The sent is something that you just must try for yourself. I found it intoxicating and couldn’t put down for long. The notes are as follows Top notes: Bergamot, Basil Leaf. Heart notes: White Patchouli. Base notes: Oak Moss. Ingredients: Potassium Stearate, Aqua, Sodium Cocoate, Sodium Cocoa Butterate, Sodium Palmate, Simmondsia Chinensis (Jojoba) Seed Oil, Sodium Avocadate, Parfum, White Kaolin, Allantoin, Glycerine. This is a Vegetal Shaving Soap Parabens-free, Lanolin-free, Sodium Lauryl Sulphate-free (SLS), Vegan friendly, Suitable for sensitive skin, NOT tested on animals. The soap texture is totally different. It’s denser but not rock hard which made it easy to use the lathering bowl. The tools I used for this shave are Masion Lambert brush along with the R89 grand razor. I ran the warm water over the brush and emptied it right in to the bowl and began to lather. 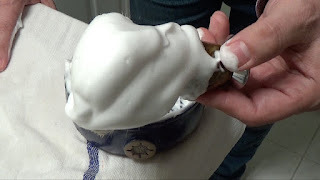 The scent was getting stronger but still on the light side and after a minute or two I created a great looking lather thick, rich and creamy. I was sporting a 5-day beard and was able to cover it completely in lather. During the shave the razor was able to move across my face with no hesitation or irritation making the slickness and glide a winner for this soap. The post shave feel was also in that category. I’m so happy that Wickham is back this new 1912 line is such an improvement over the original formula you must experience it for yourself. I liked Super Smooth (and still do) but I’m glad Darron headed in this direction it’s the right move for his customers and the right move for the company as well. I wish him all the best.